Why has the church struggled in ministering to those with mental illnesses? Each day men and women diagnosed with mental disorders are told they need to pray more and turn from their sin. Mental illness is equated with demonic possession, weak faith, and generational sin. 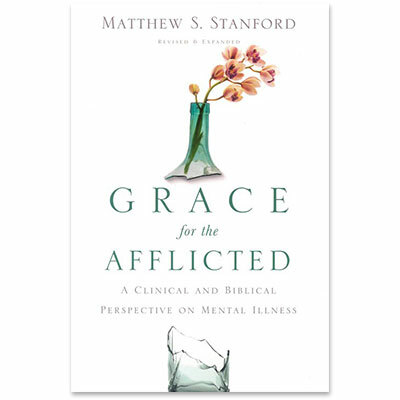 As both a church leader and a professor of psychology and behavioral sciences, Matthew S. Stanford has seen far too many mentally ill brothers and sisters damaged by well-meaning believers who respond to them out of fear or misinformation rather than grace. Matthew S. Stanford (PhD, Baylor University) is CEO of the Hope and Healing Center & Institute in Houston, Texas, and he teaches in the Department of Psychiatry and Behavioral Sciences at Baylor College of Medicine and the Department of Psychology at the University of Houston. He is the author of Grace for the Afflicted: A Clinical and Biblical Perspective on Mental Illness and The Biology of Sin: Hope and Healing for Those Who Feel Trapped. Stanford is the cofounder and served as the executive director of the Grace Alliance, a faith-based, non-profit mental health organization that provides services and support to individuals living with serious mental illness and their families. An international speaker, his research on the interplay between psychology and faith has been featured in publications including The New York Times, USA Today, and Christianity Today, as well as websites such as Fox, MSNBC, Yahoo, and US News & World Report. Stanford is a member of the American Psychological Association and a Fellow of the Association for Psychological Science, where he is the author of over one hundred peer-reviewed journal articles and book chapters in psychology, psychiatry, and neuroscience. He also serves on the editorial boards of the Journal of Family and Community Ministries and Behavioral Sciences and the Law, and is a member of the Southern Baptist Convention's Mental Health Advisory Group, and the American Bible Society's Trauma Healing Institute Advisory Council.